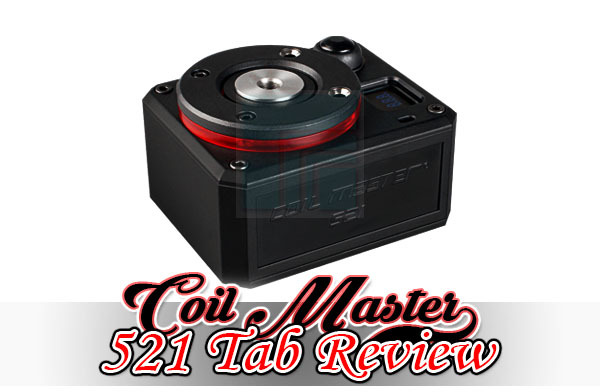 Today, I’ll be sharing my thoughts and opinions in this Coil Master 521 Tab Review. As you all know, an Ohm Meter is a must when dealing with rebuildable atomizers. We use this vape accessory every time we build a new coil, and since it’s being used so much, there will always be room for improvement. Coil Master understood just that, so they’ve improved what we know as the “ohm meter” and included a few extra perks that are very beneficial in our rebuilding experience. With that being said, I’m here today to tell you all about it in both written and video format. Enjoy! The 521 Tab by Coil Master looks phenomenal. Never have I thought I would be reviewing an ohm meter, but I’m making an exception for one since it delivers a more-than-average appearance and it’s backed with some highly beneficial features as well. Constructed of an ABS material, the 521 Tab has an all black finish. It takes on a square boxed shape, sitting 84.5mm long, 69.5mm wide and 49.5mm in depth. The top features a circled piece that surrounds the 510 connector. On this circle piece are two holes that are surrounded by metal, which are used to accepts prongs that are attached to both the leads and voltage checker that’s included with the 521 Tab. Sitting on the side of the circle is a red lens surrounding it, which lights up when the device is activated. Just to the top right is a dome style button, below that is an OLED screen, and just below that is an LED indicator that lights up blue when the burn mode is active. The face of the device says “Coil Master 521,” there right holds the micro-USB charging port, while the top face of the device contains a switch that allows you to set the device into burn mode and checker mode, as well as an option to turn the device off. The 521 Tab just looks advanced, but it’s very ease to use. The Coil Master 521 Tab comes with a slew of features, and that’s pretty awesome considering most ohm meter’s only do one thing, which is reading and display your atomizer’s resistance. 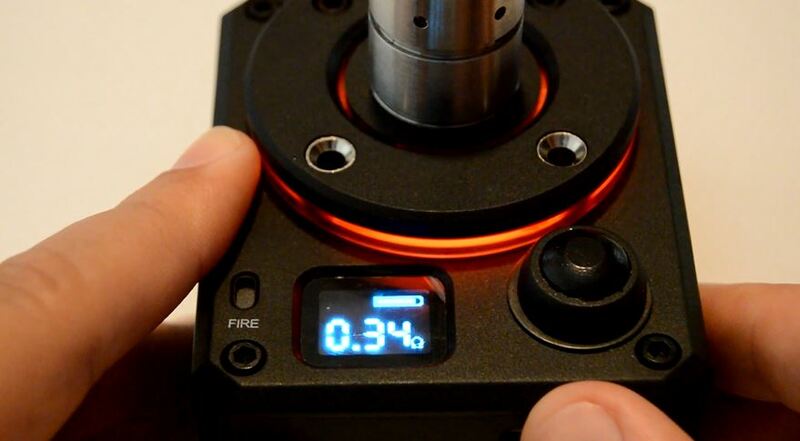 The 521 Tab has the ability to not only read the resistance of your atomizer and display it to you on its OLED screen, but also acts as a voltage meter as well. Another notable feature, which uses the leads that came with the device, is the ability to check the resistance of wire. This is very useful for understanding how much wire you’ll need before you build your coil. However, what I enjoy most about the 521 Tab is that I can use it as a deck to hold my atomizer. Using this device also saves a lot of time since you can keep your atomizer on the device even after you’re done installing your coils, to then fire it to check for hot spots. When in burn mode, simply press the button down and the atomizer will fire up by receiving power from the 18650 battery that is used with the 521 tab. 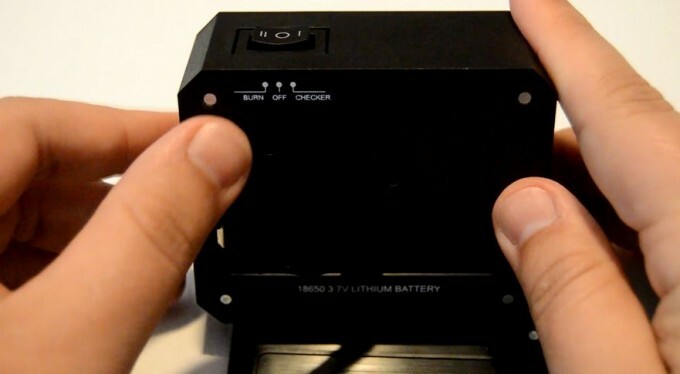 The bottom of the 521 Tab has a magnetic battery door, which seals a compartment that holds a single 18650 battery. These features are incredible for an ohm meter and can make rebuilding that much more enjoyable. The 521 Tab performs exceptionally well, and just as it should. 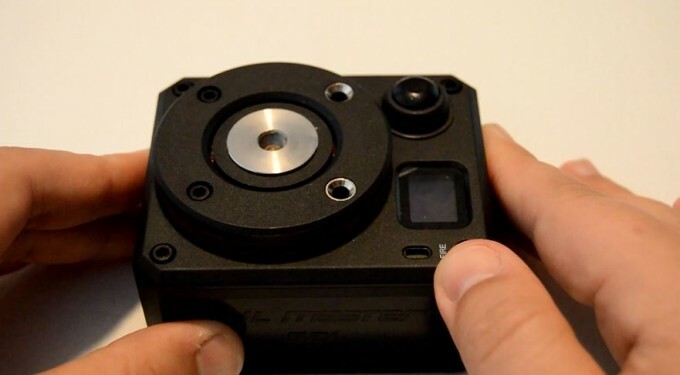 It operates quickly and very reactive when pressing the dome style fire button. The 510 spring-loaded connector has made a solid connection with every atomizer I’ve placed on it, the OLED screen is brightly lit, and the magnets in the battery door hold the door quite well. It’s also fired my atomizers perfectly, which has greatly improved the time it takes me to build and makes the experience much more enjoyable.